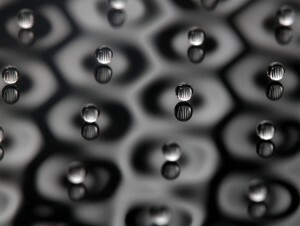 A lattice of droplets generated by our droplet generator. We present the design of a piezoelectric droplet-on-demand generator capable of producing droplets of highly repeatable size ranging from 0.5 to 1.4 mm in diameter. The generator is low cost, simple to fabricate, and suitable for hydrodynamic quantum analog experiments. We demonstrate the manner in which droplet diameter can be controlled through variation of the piezoelectric driving waveform parameters, outlet pressure, and nozzle diameter.